An election monitoring body and Catholic leaders in Sri Lanka have condemned the use of Pope Francis’ image on campaign posters featuring President Mahinda Rajapaksa and called for their removal from public spaces. “The president has already used the Pope’s image for his election campaign and there are posters in public places in Colombo,” said Rohana Hettiarachchi, executive director of the People’s Action for Free and Fair Elections (PAFFREL). 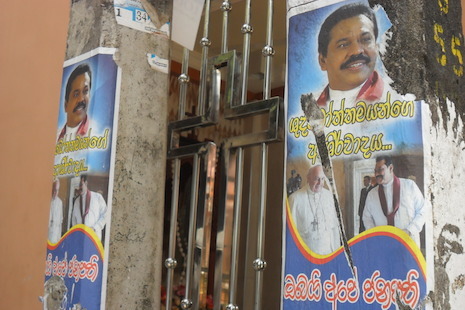 The posters, which feature the pope and Rajapaksa, have been placed in multiple locations around Colombo since last week, though it is not known who is responsible for distributing them. “As an election monitoring body, we urge the respective authorities to remove immediately these illegal posters and cut-outs,” said Hettiarachchi. Last month, the government announced it would hold a snap presidential election in January — almost two years ahead of schedule — with Rajapaksa seeking a third term. The pope is scheduled to visit Sri Lanka from January 13-15 of next year, just five days after the election, which is slated to take place on January 8. Catholic leaders in Sri Lanka also urged candidates to refrain from using posters and cut-outs of Pope Francis during their campaigns. “We urge the government and all other political parties to refrain from using the Pope’s visit for their political campaigns,” said Bishop Raymond Wickramasinghe, chairman of National Commission for Social Communication. Rev Fr Cyril Gamini Fernando, director of the National Catholic Center for Social Communications, issued a press statement on Sunday calling for the “respective authorities and persons to remove those political posters and cutouts immediately”. Minister Susil Premajayantha, a member of the national election operation committee of the United People’s Freedom Alliance, said the ruling party had no part in the creation or distribution of the posters featuring the pope and Rajapaksa. “The United People’s Freedom Alliance has never used any photograph or cut-outs of pope images for our election campaign and it is strictly prohibited in our propaganda,” the minister said. On Tuesday, Sri Lanka's elections chief and pro-democracy activists also urged police to stem campaign-related violence that has flared since the snap election was announced. Commissioner of Elections Mahinda Deshapriya said he had asked police to bring to justice those responsible for two shooting incidents since Friday, involving government supporters and backers of the main opposition candidate Maithripala Sirisena. "I have asked police about these incidents, I have told them to take action against offenders," Deshapriya said. "I seek the cooperation of political parties to ensure a trouble-free election. It is also the responsibility of candidates to restraint their supporters." Deshapriya said he was hoping to invite Commonwealth, European and Asian observers to monitor the election campaign. The Campaign for Free and Fair Elections (CaFFE), which is a private pro-democracy pressure group, said it feared an escalation of violence in the run-up to the January 8 vote. "There had been at least five major incidents involving the use of firearms and swords," CaFFE chief Keerthi Thennakoon told AFP. Police confirmed there had been poll-related violence but said investigations were underway.